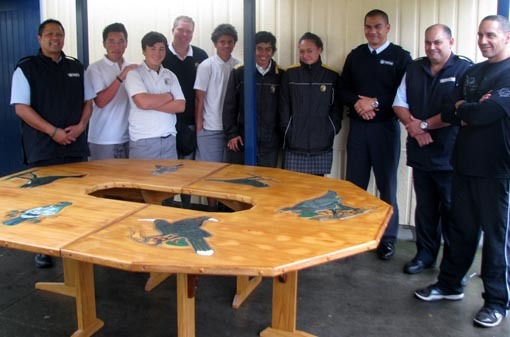 Artworks and carvings created by men in Te Whare Tirohanga Māori, the Māori Focus Unit at Hawke’s Bay Regional Prison, are gifted to schools, marae and other organisations in the community every couple of weeks. “We’re always looking at ideas and initiatives to support the community,” says Lawrence Ereatara, Principal Corrections Officer. “When the men are released they return to their respective communities. Earlier this year, for instance, Lawrence and some of his staff arrived at Flaxmere College and presented the school with a carved meeting table, a taiaha (spear), koikoi (short spear) and heru (ornamental comb). Flaxmere College principal Louise Anaru says the school was “overwhelmed and honoured” to receive the taonga. “The kōrero tuku iho (history) behind the pieces means so much to all of us. It was a heart-warming and spiritual experience, which inspired our students,” she says. There are 60 men in Te Whare Tirohanga Māori, all involved in tikanga programmes. 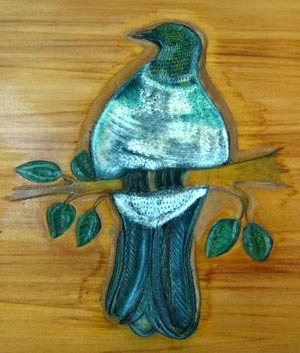 They specialise in different areas, including bone and wood carving, flax weaving and painting. It is one of five Maori Focus Units in prisons around the country. Their aim is to reduce the risk of re-offending by helping prisoners understand and value their Māori culture. The men create work that reflects a particular kaupapa, and acknowledges their Māori heritage, their whakapapa. Some of the work created by the prisoners is commissioned; some is gifted. It might be work for awards at local wānanga and schools; carved works at kohanga reo and kindergartens; or large pieces for public places such as hospitals and hospices. Other local schools to benefit recently from the gifting of work are Richmond School in Napier and Twyford School in Hastings. The Richmond School carvings depict the story of kaitiaki Moremore, son of Pania of the Reef, who was seen in many forms overseeing and protecting the rivers and coastline. The Twyford School carvings are based around the tau ihu and tau rapa of a waka. They depict the blending of cultures in today's world, the kōrero that comes down from the heavens, and life’s journey. It also helps break down barriers for the men when they are released back into the community. Original generation time 1.7066 seconds. Cache Loaded in: 0.0004 seconds.